A first-person account of a citizen science project, from our very own, Georgette. Last weekend, I gave my first go at searching for ladybugs to photograph for the Lost Ladybug Project. 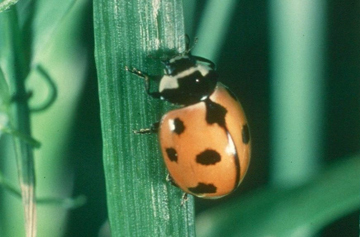 The project looks for local evidence of a few native species of ladybugs that have become quite rare in recent years, being quickly replaced by more exotic species. Ladybugs are important and beneficial predators; they eat harmful insects like aphids that damage plants. This project aims to collect photographs and raise awareness for the many important questions this change poses for agriculture like, Will these new exotic species be less able to protect farms from harmful insects? The site provides tons of useful and interesting information, from how to make your own sweep net, to illustrated ladybug identification pictures, to bookmarks, pamphlets and even a coloring book page for kids to join in on the fun! I set out on my expedition on Saturday, heading for the BioPond at the University of Pennsylvania in Philadelphia. Ripe with beautiful greenery and wildlife, I figured this was a sure spot for finding some spotted friends. With sweep net and bug box in hand I searched the area, but was unsuccessful. My lack of success continued for the next two days. Despite having certainly seen ladybugs in Philadelphia, finding them out in the wild seemed to be quite a challenge. Perhaps they really are disappearing?! My search will certainly continue. I’ve planted some cilantro and fennel in my own garden to attract the lovely critters (ladybugs are particularly fond of those herbs). In any case, I had fun and learned a lot about ladybugs in the process. If you happen to come across a ladybug, scoop it up and snap some pictures to send in to the Lost Ladybug Project. Send us (Science Cheerleader) your thoughts on the experience as well. And I’ll leave you with this lovely ladybug tune.